Ibrox Noise: "He'll get punished" - what does the future hold for Gerrard favourite? "He'll get punished" - what does the future hold for Gerrard favourite? The Alfredo Morelos saga continues unabated after yet another Jekyll and Hyde performance from Rangers’ star player when the Colombian managed to include the complete football encyclopaedia in his performance at Pittodrie last night. "If Alfredo is in the wrong, he'll deserve the red card. He'll then be missing for two games and that's how he'll get punished because he hates missing games." And he’s right – despite Andy Walker’s hysterics and curious defence of the e-HJK man last night, it is evident that there is just no justification for putting one’s boot firmly on the backside of another player. Especially not if you’re Alfredo Morelos and a walking timebomb targeted by wind-up merchants on opposing teams. 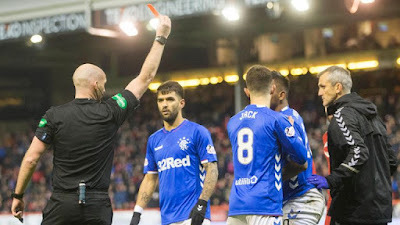 Commentator Ian Crocker said, following both goals, ad-nauseum, that Morelos was now making the headlines ‘for the right reasons’ which got a little tiring to hear for the fifth time, in fairness, but it appears to have been a prophecy of what was to come as the hitman once again let himself and his team mates down with an act of stupidity. 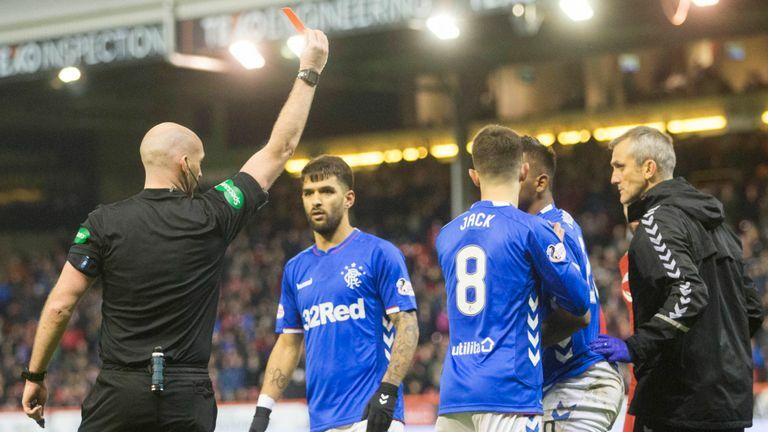 It’s his fourth red card of the season, and while he has done so much good this season as a Rangers player, it is becoming increasingly apparent that he is unable to completely remove the petulance and stupidity that blights him occasionally. It’s part of him, and he’s never going to ‘grow up’ until he’s well past his physical peak anyway and it’ll barely matter that he’s calmed down at last. Morelos is combustible. Steven Gerrard has done a stellar job getting far more out of him than previous managers did – we have seen more like the best of the striker. His second goal especially ranks up there as one of his best in the shirt. But he’s not going to douse the fire in his belly, and he’ll never be ‘chilled’. He will always be ready to lash out, do something stupid, and generally let everyone down. And what do we want to talk about? His two brilliant goals. His ‘shhh’ celebration to Aberdeen fans who’d abused him all match – his strong physical hold up play where he was a total nuisance to McKenna and Considine, and that rare but brilliant smile when he’s done something great or actually looks happy. But no, it’s about the damn red card again. Alfredo. What WILL we do with you? We just have to accept, that great players have quirks. They're not, programmable robots. Gazza was the same, George Best and the likes. Walter Smith, knew that. I'm happy to put up with his immaturity, as long as he's scoring goals. If he gets red-carded again, Jermain is there to step in. So no great problem. Agreed. If it deters big EPL clubs coming in with big money for him, then all the better for us. I do worry though about him potentially running down his contract, while other clubs wait for him to do so and give him a big pay packet. This means his behaviour issues do affect his market value. Agree with Joe. have a backup plan. When we get an offer too big to refuse, we sell. The good news is that his cards may allow us to keep him for another season. He is going for £20M large, so if we don't get offered that in the summer, he stays another year. He can be unpredictable and combustible with a character that is always willing to explode but the most telling thing you said was that he had let himself and his team mates down with his stupidity. He knows that and seems unable to do anything about it. It's a fatal character flaw that will stop him going as far as he can in the game. And we don't have to just accept it. The way he is going now he will be heading for 6 or 7 red cards this season. That is unacceptable!